Student athletes currently enrolled in grades 8 – 12. It is the responsibility of the applicants to discuss their individual skill and experience levels with their coach/trainer and accurately apply to show in the proper division in compliance with the definitions and descriptions of the CPI Hunt Seat Divisions as set forth in the rules. 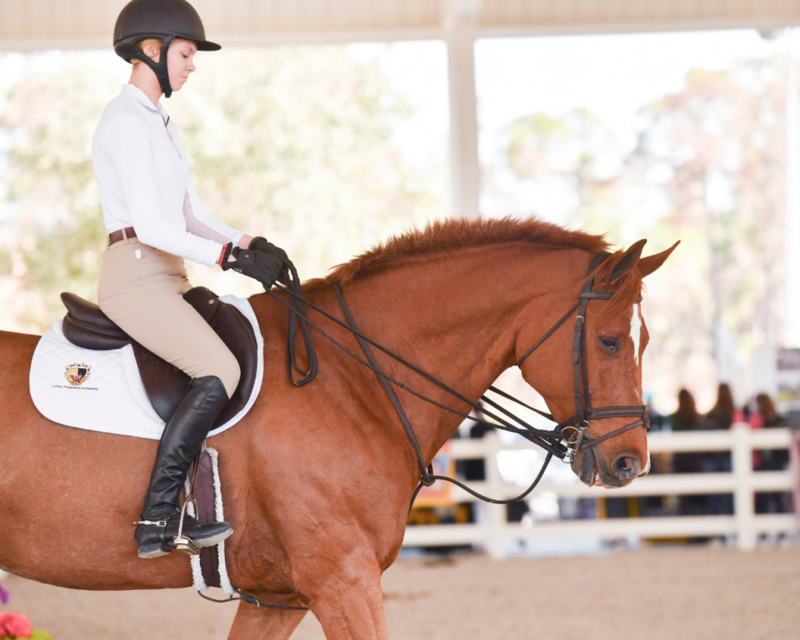 The CPI is not responsible for any athletes’ misrepresentations of their equitation ability to show on an unknown horse in the CPI Horse Show. CPI Advanced Equitation Over Fences Class – To be shown on an unknown horse over six or more fences at least 2′9″ in height and not to exceed 3′ in height and 3′ in width, including at least one change of direction. Tests 1-13 maybe asked. CPI Advanced Equitation on the Flat Class – To be judged at the walk, trot and canter both ways of the ring. Tests 1– 11 may be asked. CPI Open Equitation Over Fences Class – To be shown on an unknown horse over six or more fences at least 2′ 6″ in height and not to exceed 2’9”, including at least one change of direction. Fence width not to exceed height. Tests1-9, and 12 & 13 may be asked. CPI Open Equitation on the Flat Class – To be judged at the walk, trot and canter both ways of the ring. Tests 1- 9 may be asked. CPI Intermediate Equitation Over Fences Class – To be shown on an unknown horse over six or more fences at least 2′ 3″ in height and not to exceed 2′ 6″ and including at least one change of direction. Fence width not to exceed height. Fences must have wings at least 12′ higher than the highest rail. Tests 1-6, 9, and 12 & 13 may be asked. CPI Intermediate Equitation on the Flat Class – To be judged at the walk, trot and canter both ways of the ring. Tests1-9 may be asked. CPI Novice Equitation Over Fences Class – To be shown on an unknown horse over six or more fences at least 2’ in height and not to exceed 2′ 3″ and including at least one change of direction. Fence width not to exceed height.Fences must have wings at least 12′ higher than the highest rail. Tests 1-6, 9 may be asked. CPI Novice Equitation on the Flat Class – To be judged at the walk, trot and canter both ways of the ring. Tests 1-6,9 may be asked. CPI Walk Trot Canter Class to be judged at the walk, trot and canter both ways of the ring. Tests 1-5, 9 may be asked. Two-point position at the walk and/or trot. Ride without stirrups. Athletes will be given the option to cross their irons. Half-turn on forehand and/or half turn on haunches. Trot a jump not to exceed 2′ 6″. Applications must be submitted online. Applicants must provide complete and accurate information concerning their riding experience as part of their application. It is the responsibility of the applicant to discuss the criteria to participate in the CPI with their trainers/coaches and to accurately apply to show in the proper division according to their experience level and in compliance with the definitions and descriptions of those levels as set forth in the rules. The CPI has the right to refuse, accept conditionally, or to cancel any applications that are deemed ineligible. Notice of this action by the CPI will be sent to the applicant to the email indicated on the application. Once received, the application will be reviewed by the CPI (allow up to two weeks’ time for review), a Formal Invoice to Participate will be sent via email to the applicant and parent/guardian email addresses provided on the application. When an applicant is invited to show at the CPI, payment is due 14 days after applicant has been sent the invoice. CPI will be offering a mounted clinic on Friday, January 17, 2020 to a limited amount of CPI Horse Show participants for an additional cost. Space is LIMITED and is offered on a first come, first serve basis. In order to participate in the clinic, you MUST select that you would like to participate/register for the clinic on your registration/entry form as well as the appropriate clinic division. If payment is not received within the 14 days, the application will be deleted without notice from the CPI database. Applicant may re-apply as long as the CPI is still accepting applications. CPI will be offering a mounted clinic on Saturday, September 21, 2019 to a limited amount of CPI Horse Show participants for an additional cost. Space is LIMITED and is offered on a first come, first serve basis. In order to participate in the clinic, you MUST select that you would like to participate/register for the clinic on your registration/entry form as well as the appropriate clinic division. Application Fee: $30.00 – Application fees will not be refunded and cannot be transferred to another application/CPI event. Once received, the application will be reviewed by the CPI (allow up to two weeks’ time for review), a Formal Invoice to Participate will be sent via email to the applicant and parent/guardian email addresses on the application.When an applicant is invited to participate at any CPI College Spotlight event, payment is due 7 days after applicant has been sent the invoice, if payment is not received within the 7 days, the application will be deleted without notice from the CPI database. Applicant may re-apply as long as the CPI is still accepting applications. There are absolutely no exceptions for applicant cancellations and entries CANNOT be transferred to another CPI Horse Show Event. We highly recommend travel insurance to protect the applicant/athlete, family members and trainers from travel penalties assessed for cancelling participation in the CPI Horse Show. The following policies shall apply to any and all applicant/athlete cancellations for those participating any CPI Horse Show. Cancellations must be made by email to info@collegeprepinvitational.com. If you do not receive an acknowledgement response via email within 24 hours, please call (786) 369-9040. Depending upon when the cancellation is made, a cancellation charge may apply, application fees and fees for the mounted Clinic are NON-REFUNDABLE AND NON-TRANSFERABLE. There are absolutely no exceptions for applicant cancellations. We highly recommend travel insurance to protect the applicant, family members and trainers from travel penalties assessed for cancelling participation in the CPI College Spotlight. All fees for the CPI College Spotlight are NON-REFUNDABLE. Cancellations must be made by email to info@collegeprepinvitational.com. If you do not receive an acknowledgement response via email within 24 hours, please call (786) 369-9040. If CPI Management must cancel classes at the event due to circumstances beyond the reasonable control of the CPI, including but not limited to, acts of God, war, terrorism, weather, accidents, fires, safety concerns, no refunds will be given for fees. Horses and Order of Go will be assigned by a random draw on the day of competition. Only an athlete registered at the current CPI event is allowed to be riding the horse while on the show grounds. ʺTuning‐upʺ by persons other than the athlete registered at the current CPI event is prohibited. Show management shall post courses to jump at least on one hour prior to the commencement of the class. Before jumping classes, each athlete will be allowed only two warm-up fences, in the pattern posted by the show steward. Warm-up fences may only be changed by a steward or show official. All classes will be judged on equitation, and faults of the horse will not be judged. Judges’ decisions shall be final and may not be protested. The P.A. system is used to help the show move as smoothly as possible but is only a courtesy. It is the responsibility of the athletes to know when they are required to be in the warm-up area or arena. Not hearing or understanding gate calls, etc. is NOT an excuse for missing one’s order of work or class. The CPI Horse Show Management reserves to itself the right to limit entries in any class or division; to refuse, accept conditionally, or to cancel any entries; to disqualify any athlete; to prohibit exhibition of entries, and cancel award prizes, without any claims for damages; to change any course to add a dotted line, to change an athlete’s horse draw; to reschedule classes, after due notice to exhibitors; to change rings or rotate judges, to alter or modify any class procedures, obstacles, patterns, or rules in this book for safety concerns, show facility restrictions, or other mitigating circumstances. An athlete is considered to have fallen when s/he is separated from their horse that has not fallen, in sucha way as to necessitate remounting or vaulting into the saddle. In the event of a fall/accident where the athlete is apparently unconscious or concussed, s/he is precluded from competing and will be evaluated by qualified medical personnel at the show. The fall/accident that results in unconsciousness or concussion shall be reported to the CPI Show Manager. A horse is considered to have fallen when the shoulder and haunch on the same side have touched the ground or an obstacle on the ground. In the event of a horse fall, the Stewards determine if a re-ride is granted. Three refusals will result in elimination. No courtesy fences will be allowed after elimination. The CPI competition would not be possible without the generosity of horse providers. Not every draw will be ideal. Judges evaluate athletes with a discerning eye and an understanding of the random draw format. Only in an extreme extenuating circumstance will a re-ride be granted by the show steward. When through no fault of the athlete, a horse performs so poorly that it is impossible to fairly judge the athlete’s ability, a re-ride may be granted. A re-ride must be requested prior to the lineup in a flat class or the last horse leaves the ring in an over fences class. Only the coach of the athlete may request a re-ride. Although they may confer with show management and the judge, only the show stewards may grant or deny a re-ride. If a re-ride is granted, it shall be judged as if the first ride never occurred. If a re-ride is granted in a class in which athletes compete individually, the re-ride shall take place after all other rides in that class have been completed. If a re-ride is granted in a class in which athletes compete together, the class shall be held over in its entirety, and no consideration shall be given to the performance during the original session. It is the tradition of the show ring that athletes are correctly attired for the class in question. It is mandatory for all athletes to use appropriate show attire, including boots and helmets at the horse draw. A show committee may, at its discretion, bar any entry or person from entering the ring if not suitably presented to appear before an audience and must bar riders without protective headgear. At all times while mounted, athletes must wear a harnessed and fully fastened protective ASTM approved safety helmet. Contestant numbers shall be worn on the athletes back. Tack and equipment used is at the discretion of the horse provider. No substitution of tack or aids by athletes which could affect horse or tack shall be permitted. It is the responsibility of the athlete and or coach to check the tack before mounting; any tack concerns must be communicated to the show steward for adjustment. A list of aids appropriate to each horse will be posted or accompany each horse. Athletes shall comply with the suggested use of aids. Athletes are responsible for supplying their own crops, whips, and bats and may be carried only when specified by horse provider; it is up to each horse provider to determine if they will allow crops to be used on their horse. Crops, and bats are not to be used before entering the schooling or show rings. Stewards may rule that an athlete be disqualified for improper use of crops and bats. Spurs provided by the horse provider are permitted and it is up to each horse provider to determine if they will allow spurs to be used on their horse. Designated schooling times for horses will be made available at registration, if not earlier. Schooling sessions will be supervised by designated members of the show committee. No athlete that is showing in the CPI Horse Show may school any horse on the show grounds unless they have finished all possible phases of the mounted competition. In order to compete at the CPI, a athlete is required to have a trainer/coach present when competing and said trainer/coach must register with the CPI. A athlete will not receive their back number and will not be allowed to participate if their coach does not sign the applicable CPI coach release forms. The athlete may use their coach of choice or may hire a CPI coach. Only the coach is allowed to accompany the athlete into the horse mounting area at the show. No other person may accompany the athlete into the mounting area or the in-gates and their surrounding areas. The coach is responsible to check and adjust the provided horse tack in the mounting area prior to entering the practice jump ring. Only the assistance or coaching of the registered coach is permissible while athlete is competing in a class. Assistance or coaching by any other individual may warrant disqualification. No electronic communication devices will be allowed by exhibitors while in the class. Good horsemanship and honorable participation are priorities at the CPI Horse Show. It is the responsibility of all attendees to foster an atmosphere of community enjoyment and respect for all participants and horses. The CPI Horse Show is made possible by the animals, who serve the athlete. This is a sport of grace and elegance, where athlete and animal work as a team. There is neither grace nor sportsmanship in an abusive spectacle. It is the responsibility of all parties concerned to be aware of the conduct of participants and the condition of the horses; and, if a violation is observed, a report must be made immediately to the Stewards. Athletes, spectators, and coaches are required to behave in a manner that reflects the dignity of the sport. Ill-mannered or unsportsmanlike conduct will not be tolerated. Any behavior deemed inappropriate may be presented as a protest to the Stewards. The CPI show management may disqualify and expel from the grounds any person whose behavior is deemed dishonest, unethical, or detrimental to the health, safety, or wellbeing of any horse, person, or the CPI, during the progress of the event. If an athlete participates in any capacity in the College Preparatory Invitational Horse Show (CPI), this participation constitutes an agreement and affirmation that the athlete, and each of its coaches, trainers, parents and representatives shall accept and abide by the Rules and Regulations of the CPI and of the show, and that each athlete is eligible as entered in the application and will accept as final all rulings of the CPI and the show steward (or committee) with respect to their conduct. Also, through participation, each athlete, athlete’s parents/legal guardians, coach, trainer, and participant acknowledges THAT HORSES ARE INTRINSICALLY DANGEROUS AND UNPREDICTABLE AND CAN CAUSE SERIOUS INJURY OR DEATH, thus each agrees to indemnify, defend and hold harmless the CPI, its officers, directors, members, employees, agents and representatives, the event host coordinator and facility, the show stewards, stewards committee members, the show judges, the show secretary, all show organizers and officials, and all persons, stables, and others providing facilities, horses or equipment for the show, other riders, coaches, sponsoring institutions, from any claim, action or suit, for injury, property damage or death sustained by the individual, rider, entity, coach, trainer, or participant while traveling to, from and around the show, while staying in the city for the show, during participation in the show and while at the show. This entry constitutes an acceptance of the hired officials at this event. By participating at the CPI Horse Show in any capacity, the athlete, and parent/legal guardian of an athlete under the age of 18, certify that they thoroughly read this and understand the liability statue for the state of whichever event they are participating in and acknowledge that they have health and hospital insurance covering the athlete and promise that they will maintain that insurance at all times while the athlete is a participant of the CPI. WARNING: UNDER NEW JERSEY LAW, AN EQUESTRIAN AREA OPERATOR IS NOT LIABLE FOR AN INJUSRY TO OR THE DEATH OF A PARTICIPANT IN EQUINE ANIMAL ACTIVITES RESULTING FROM THE INHERENT RISKS OF EQUINE ANIMAL ACTIVITIES, PURSANT TO P.L. 1997, c.287 (C.5: 15-1 et seq). WARNING: UNDER THE MICHIGAN EQUINE ACTIVITY LIABILITY ACT, AN EQUINE PROFESSIONAL IS NOT LIABLE FOR AN INJURY TO OR THE DEATH OF A PARTICIPANT IN AN EQUINE ACTIVITY RESULTING FROM AN INHERENT RISK OF THE EQUINE ACTIVITY. During the College Preparatory Invitational events, photographers, photo journalist contestants, and video production crew will be capturing photos and video to be used for publicity. By attending the CPI, participants and their family members release any interests in images of photos and video taken of participants and acknowledge that no payment has been made or is due to participants. The CPI show management may disqualify and expel from the grounds any person who does not abide by this rule.